Apron Feeders are provided for extraction of material from hoppers and bins and for applications having high impact loads. These feeders are used for controlled volumetric feeding of bulk materials. The apron feeders have reinforced double beaded overlapping pan design and heavy-duty frame construction to absorb high impact loads and to conduct positive extraction from hoppers/silos. The apron feeders are tailor made for handling any type of application from feeding run-of-mine quarry rock with lumps as large as 2000 mm dumped on to the feeder to light duty applications for extracting crushed material from small bins. BHP Apron feeders are made in three different basic designs such as Heavy Duty Frame roller supported feeders, Outboard roller supported feeders and Light Duty Chain roller supported feeders. Each of the three types is available in a wide range of sizes and custom designed features to meet specific applications. BHP has supplied heavy-duty apron feeders for handling 1400 TPH of run-of-mine limestone up to 1500 mm in size for feeding the primary crushers. 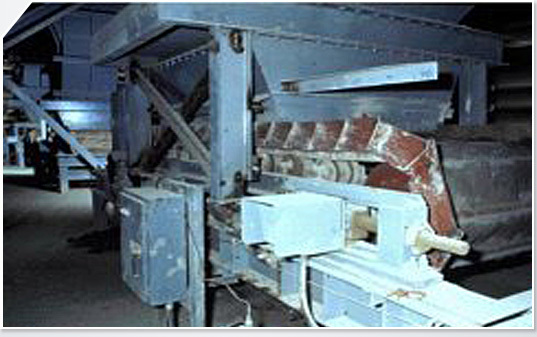 Totally enclosed box type feeders have been provided for various applications where false air entry in to the conveying system has to be avoided. Box feeders up to 1000 TPH capacity have been supplied for limestone applications.